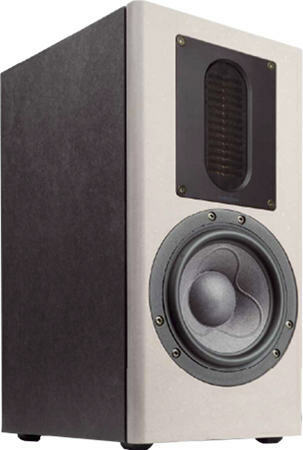 The Monitor M1i is a high-end 2 way bassreflex bookshelf speaker with air motion transformer and Scan-Speak woofer. The kit is delivered with the outstanding Audaphon AMT 1i tweeter and an excellent woofer Scan-Speak 18WU8741T00. M1i has been developed by Dennis Frank and Daniel Gattig. The frequency response of this speaker is linear with reinforcement of bass and treble. The decay spectrum is nearly perfect. At low volume, i.e. 85 dB at 1 m, the nonlinear distortions are lower than 0.4% above 300 Hz and rises not over 1% at 95 dB at 1 m .
The kit comes with ClarityCap capacitors of high quality. The inductances are baked varnish air core coils for minimizing microphonic effects. - The current flow through the coil creates a magnetic field which sets the reel of wire in motion. This motion induces a voltage in the coil which adds itself to the signal. The stiffer the reel of wire is, the less the signal will be altered. The high-end kit comes with ClarityCap capacitors of high quality. The inductances are baked varnish air core coils or Mundorf copper foil coils for minimizing microphonic effects. - The current flow through the coil creates a magnetic field which sets the reel of wire in motion. This motion induces a voltage in the coil which adds itself to the signal. The stiffer the reel of wire is, the less the signal will be altered.